However, the reality of the ‘secret chef’ is much more mundane. Secrets are by very definition private and the word segreto in Italian can mean either. A proper translation of cuoco segreto would be something like ‘privy chef’: the man employed at the Vatican to provide meals for the pope, his household, and prepare stunning banquets when needed to project papal power and authority as God’s chosen representative on earth. Not only is Bartolomeo Scappi the most famous of these ‘secret chefs’ but he’s also, in the word of John Dickie in Delizia!, ‘undoubtedly the greatest cook of the Italian renaissance’. This accolade is mostly due to the Opera di Bartolomeo Scappi, a massive cookbook he published in 1570. The most fascinating part of the work is his description of the culinary arrangements for the 1549 conclave, which lasted over two months, and elected Pope Julius III. It’s a remarkable insight to the planning and administration of such an event, and how restricting food was used in the end to force cardinals towards a decision when the Holy Spirit was not forthcoming. 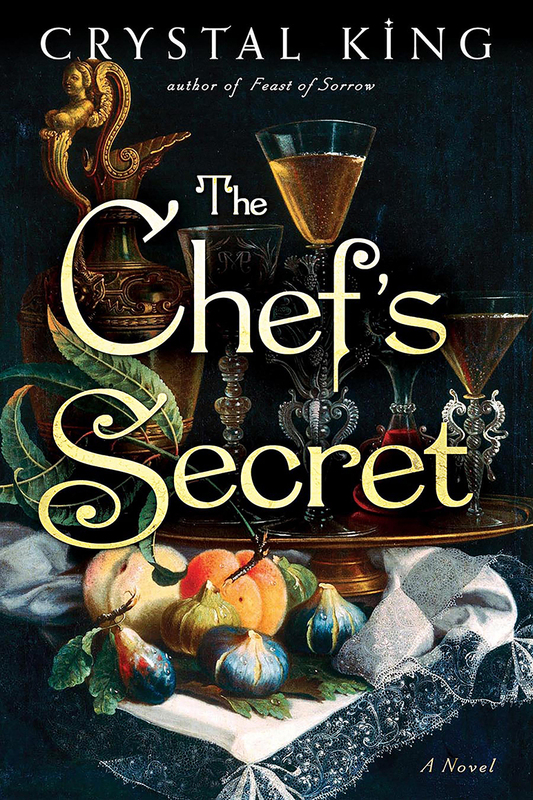 Crystal King takes the life of Bartolomeo Scappi as her starting point for her new novel The Chef’s Secret (published 12 February 2019 by Simon and Schuster). Twisting the plot as she does the title, she creates for him a secret life which, we discover through a set of secret diaries, mostly written in a secret code. It’s The Scappi Code, if you will. The novel begins in 1577, just after the death of Bartolomeo. His apprentice and heir, Giovanni, takes possession of the volumes of Scappi’s diaries, which Bartolomeo left with an injunction to destroy them without reading them. Predictably, and luckily for us, Giovanni ignores his master’s instructions and risks the dire consequences promised for not burning the diaries. Through them we are taken through a story of intrigue, love, honour, and violence, knowledge of which could spell death and disaster for Giovanni at any moment. The result is a fast-paced renaissance romp through the cities of Venice and Rome. One which is is very difficult to put down. The plotting of this book is excellent. Bartolomeo’s secret weaves itself through his life like a thread as red as a cardinal’s cassock. The reader is propelled through a labyrinth where it is difficult to see the whole picture until it is presented at the end. The characters start off as pantomime heroes and villains, but each of them has their own secret which, by and by, adds depth to their personalities. King has obviously done a lot of research for this novel and it shows. For me, it was let down a little by some errors, mostly to do with places in Venice, which led to a couple of glaring anachronisms. Maybe, these are things that only I would notice, but I did. Also, the dialogue, while mostly modern was peppered with a few phrases, which seemed lifted from Shakespeare, to give the book a renaissance air. These jar and are unnecessary. They have the opposite effect of helping the reader to suspend disbelief. The major disappointment for me, however, was in the book’s treatment of the food. I was expecting to be immersed in the atmosphere of the renaissance Roman kitchen, full of fragrances, tastes, and noises. Instead, there are long lists of food prepared by the protagonists—lifted from the pages of the Opera di Bartolmeo Scappi—but the reader is left to imagine what they might have tasted like. The result is that food and cooking, which would have been central to the lives of the secret chefs, seems pushed to the side-lines. Rather than a novel about food, we have a novel which includes food. It seems a missed opportunity. On the whole, however, The Chef’s Secret is highly enjoyable and a worthwhile investment of both the cover price and reading time. Aficionados of the historical novel will not be disappointed. So, prepare to be propelled through the streets of renaissance Venice and Rome in your quest to discover The Chef’s Secret. The Chef’s Secret is published by Simon and Schuster and is available in hard cover, paperback, digital and audio editions from Amazon. Disclosure: I was offered a free advance copy of the book from the publisher, in return for an honest review. An excellent read, in my opinion! Great review. I enjoyed the food mentions, though I can also see, since you are a chef by profession and training, that you’d want more sensual descriptions of flavors, scents, textures. 🙂 I’m waiting for you to recreate a Scappi menu for your blog sometime. I did really enjoy it, but expected more sensuality on the food front. Looking forward to seeing your contrubution to the companion volume! Scappi recipes coming soon then! Thank you! I was so pleased and proud to have been asked to contribute. And thank you again for helping me with the meat suggestions and the Italian translation. I really appreciate it.